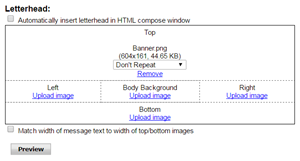 You can add letterhead images to your Workspace webmail messages. 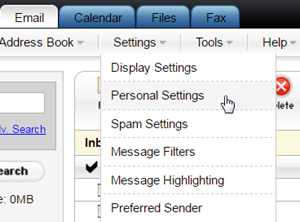 On the Email tab, and click Settings. Under Letterhead, decide where you want to place your images, and click Upload Image to browse for your image file. You can have the image Repeat Top to Bottom, or Don't Repeat. If you want the letterhead layout to automatically insert into your compose window, select Automatically insert letterhead in HTML compose window, located at the top of the Letterhead section. Note: You can always add the letterhead at any time, by clicking Insert Letterhead in the composer. If you've added a top or bottom image, and would like the email to match the width of the image, select Match width of message text to width of top/bottom images. Click Preview to look at a sample of your letterhead layout.